Mice express 4 of the 5 available IgG subclasses making up their IgG isotype. They typically encode for IgG1, IgG2b and IgG3, and depending on their strain will also express either IgG2a or IgG2c (Collins 2016). IgG2a and IgG2c subclasses are seen as functionally comparable, being the most active of the subclasses to bind complement (Collins 2016). Inbred mouse strains, such as C57Bl/6, C57Bl/10, SJL and NOD mice, possess an IgH-1b allele which results in expression of IgG2c instead of the IgG2a subclass expressed by BALB/c and Swiss Webster mice. The IgH-1a haplotype of these mice strains include the IGHG2C gene alongside the other isotypes, but not the IGHG2A present on the IgH-1b haplotype of the BALB/c mice (Martin et al 1998). 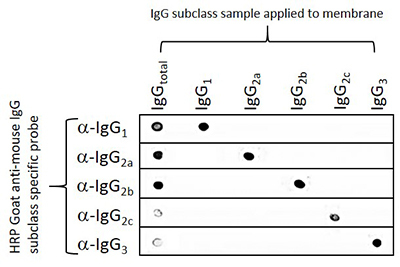 A number of monoclonal antibodies originate from these inbred stains, and some IgG2c clones have been incorrectly isotyped as IgG2a by reagents that cannot distinguish between these two subclasses. Subclass specific antibodies from Jackson ImmunoResearch provide exquisite discrimination among the subclasses. Jackson ImmunoResearch anti-mouse IgG, subclass specific antibodies offer specificity to the 5 individual mouse IgG subclasses. These highly specific antibodies are designed to distinguish between two or more different subclass of mouse IgG in multiple labeling experiments, or for mouse IgG subclass determination. They have been adsorbed against human, bovine and rabbit serum proteins to minimize interference from cross-reactivity with tissue immunoglobulins, adherent bovine IgG on cultured cells and rabbit primary antibodies. Anti-Mouse IgG, subclass specific antibodies are available conjugated to Alexa Fluor® and Cyanine™ Fluorescent dyes, Biotin-SP™, and horseradish peroxidase and alkaline phosphatase reporter molecules. The example below illustrates the performance of the Goat Anti-Mouse subclass specific antibodies in a dot blot experiment. In each case, the subclass specific antibody only recognizes its specific target in the presence of additionally blotted subclasses. Figure 2: Dot blot showing the specificity of goat anti-mouse IgG, Fcγ subclass specific antibodies. Separate nitrocellulose strips (rows) received 100 ng “dots” of mouse IgG and each subclass, and then were blocked with 5% (w/v) BSA in PBST. After probing with Peroxidase-conjugated goat anti-mouse subclass specific antibodies, the strips were developed with TMBM substrate from Moss, Inc. The grid of positive signals shows the specificity of each subclass directed antibody. Some subclasses are poorly represented in a total IgG pool (IgGtotal, α-IgGs 2c and 3) and thus give weak signal. Peroxidase conjugates used for probing were 115-035-205 (anti-mouse IgG1), 115-035-206 (anti-mouse IgG2a), 115-035-207 (anti-mouse IgG2b), 115-035-208 (anti-mouse IgG2c), and 115-035-209 (anti-mouse IgG3). *Subclass specific antibodies are not necessary for general detection of mouse monoclonal antibodies in single-labeling experiments or in multiple-labeling experiments involving one mouse monoclonal and primary antibodies from other species.